Measuring the moisture content in powdered drinks is an important quality control step. With low moisture content, product can be packaged at the optimum moisture level to increase shelf life and product quality. With the correct low moisture content, reactions in powdered drinks stored at room temperature take place so slowly that the nutritive value is not affected, even after years of storage. With the help of industry partners and 40 years of knowledge, MoistTech has developed the IR 3000 Moisture Sensor which is ideally suited to measure the moisture levels in the powdered drink production process while improving manufactures product quality and lowering their energy costs. Typical target moisture content is 0.30% – 4.0%. 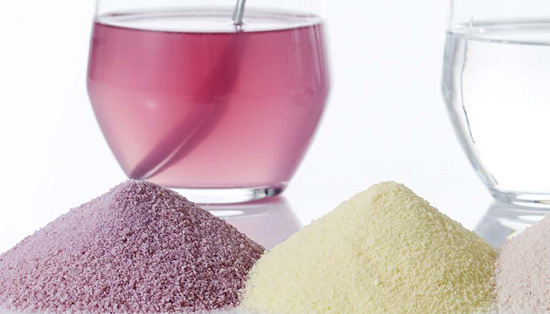 Spray drying is the primary method used for drying drink powder in the industry. Spray drying in its simplest form consists of atomizing the feed, spray-air contact, drying, and separation of the dried product from the drying air. Many powdered drinks can absorb moisture from the environment under ambient conditions. The MoistTech Online NIR sensors are used by quality control personnel to continuously measure and monitor the moisture content after the spray drying process and/or just prior to packaging. The MoistTech 3000 Series sensors are available in many enclosures and the most common for the food industry is the 3000F Food Grade. The fast, accurate and repeatable MoistTech 3000 Series sensors can be mounted online for instant measurement outputting information using any of our options for local display or closed loop control. With the MoistTech 3000 Series sensors there is no waiting for lengthy offline tests with human error. If you would like to test powdered drink moisture levels, contact us today for more information!